eat run sail: Back on Board and So Happy to be Here! My surgery on Thursday went very smoothly, thanks to all of the nurses who looked after me before and after, the kind attention of the anesthesiologist who gave me the 'lots' of sedative I asked for, the operating room assistants and the awesome surgeon who performed the miracle. The Captain was waiting for me with a banana and a 6-inch turkey and Swiss Subway sandwich which I wolfed down, and off we went to the hotel. The Captain had already checked us into the sweet room in the charming old inn that would be home for the next few days, and I settled in to my special chair. I saw the surgeon early Friday morning at his office, where he removed my eye patch and declared his handiwork a rousing success and then gave me a prescription for 2 different sets of drops, reminded me I need to spend the next 72 hours face-down and then come back and see him again in a couple of weeks. When we got back to the hotel I was shocked when I looked in the mirror. My right eye was completely bloodshot. The soft tissue all around my eye was swollen and there was an enormous, dark bruise forming underneath the eye. Apparently the doctor gave me an infection of painkiller between my eye and nose, and once the bandage was off, the blood in the broken vessels started to move. I looked like I lost a serious fight! Back at the inn, I did as told and can honestly say I didn't complain out loud, not even once, but pretty much hated most of the next 72 hours. I went from my special chair with my face in a pillow, to the chair at the desk in our room with my face in a pillow, to the bed on my tummy with my face in a pillow. The only relief was having a bath each morning. I learned to drink tea and coffee through a straw. And I ate lots of chocolate, and sweets and McDonald's French fries, and white pizza. If I haven't gained 4 pounds it will be a miracle, but at this point, I don't care. Of course I ate healthy foods too but really craved sweets and comfort food. The Captain was wonderful. He rubbed my back and massaged my shoulders, helped me dress, helped me bathe, made me tea, went out for food and kept me entertained and watched over me like a mother hen. He encouraged me and kept telling me how well I was doing and how proud he was of me... how could I possibly think to complain when he was doing all the work and I was merely sitting... with my face in a pillow? On Sunday afternoon we did venture out for a short walk... me watching the sidewalk all the time... but the warmth of the sunshine and fresh air were wonderful. Last night was the worst. I only managed to sleep for a couple of hours at a time and kept getting up, just to move a bit. Finally, at 6 this morning, I declared that I was done with face down, and we got up and got our day started. It felt really good to have a shower instead of a bath, even if I didn't hold my head up under the water stream, and it was great to check out of the inn and head back to the marina and get back on board the sailboat. 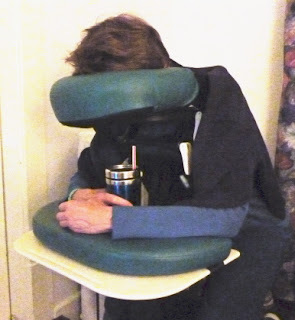 I do not miss my special chair and I am so looking forward to a good night's sleep in our own bed... and even though my vision is foggy through the gas bubble in my eye, I can already tell that it will be better after it has healed completely, than it was before the surgery. Today the eye looks less scary, the bruising underneath is fading considerably but I am feeling very weak and don't seem to have much stamina. I think tomorrow I will start an easy walking program to see if I can get some energy and strength back. Thanks for all the good wishes and kinds words of support and encouragement. I'm so glad you're alright and the surgery went well. I can't imagine your 72 hours...but I'm happy you had someone with you taking good care of you. Here's to being back to 100% soon!! Glad to hear you are getting better! He sure did take good care of you! so glad to hear you are doing well, and such amazing spirits you are in!! You are amazing for going through that and taking charge of it! so so so glad to hear that you are doing well! and are healing! the captain sounds AMAZING! and i am so glad you had him there by your side to take care of you! continuing to think about you! and hoping you get that strength back quickly! I am so glad you are on the road to recovery. You are a trooper! So glad you're healing and the Captain is nurturing his baby hen!!! So cute!! So glad to hear the procedure went well! I was thinking about you for sure! That chair looks like it would get really old, really fast! I am glad you have such a great husband to take care of you.